A traitor being hung, drawn and quartered. Treason is perhaps the most infamous crime in English Legal History, due in part to the horrendous punishment that came with it but also due to its often strong political importance. The punishment that was often inflicted was the drawing of the traitor across rough ground by horse, he would then be hanged to within an inch of death, followed by being disembowelled, burnt, and beheaded. Your remaining carcass was cut into four pieces. 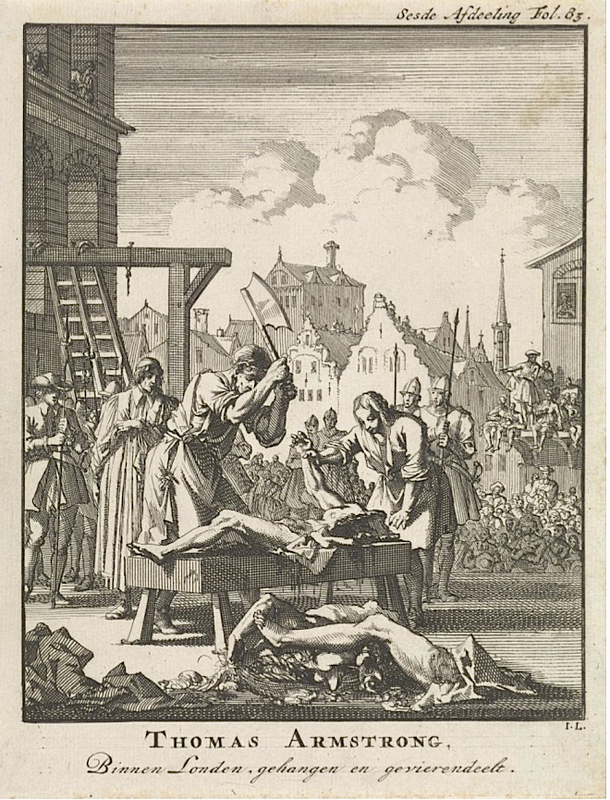 The punishment of being hung, drawn and quartered has morbidly captured the public’s imagination for many centuries. The core aspect of Treason was, and still is, betrayal. If you follow history back to the earliest Germanic tribes, a man who betrayed his kin to the enemy tribe was killed, often in a highly sacrificial manner. There are also significant Roman influences through Christianity, Judas was the ultimate betrayer, he betrayed his Lord Jesus Christ. The betrayal of your Lord, be that your King or your immediate Landlord was thus characterised as the worst of crimes. Pre-13th Century Treason encompassed a wide range of activities. For example, these included fleeing from battle, plotting the death of your King or Lord, forging your Lord’s seal and committing adultery with the Lord’s wife. A particularly severe case is Peter of Wakefield being hanged for predicting John would no longer be King by next year. Treason garnered significant political and economic importance due to the fact that a traitor’s land would be forfeited to the King, rather than to his Lord. If the criminal had just committed a normal felony, his lands would be forfeited to his immediate Landlord. The King and his justices thus wanted to expand the coverage of Treason, whereas the normal Lords wanted to keep it limited. In the 13th Century and onward, a distinction began to emerge between High Treason and Petty Treason. Broadly, High Treason was an act of betrayal against your King, whereas Petty Treason was an act of betrayal against your immediate Lord. The latter crime came to encompass the murder by a wife of her husband or the murder of a Bishop. Indeed, the crime of Petty Treason disappeared in 1828 as it was downgraded to murder. It is interesting note that the benefit of clergy, which originally protected religious officials from prosecution outside of the non-religious courts, was held not to apply to High Treason. The development of Treason was going off in several directions and was becoming unclear. Parliament thus enacted the Treason Act 1351 which laid out a definition of High Treason, which until then had been contained in case law. This statute’s main definition is still in force today, although thankfully the Crime and Disorder Act 1998 instituted a maximum punishment of life imprisonment, rather than death. For the history of capital punishment in the UK, please see my blog post here. The Treason Act included such activities as planning the death of the King or Queen, or their eldest son. Moreover, it included committing adultery with the Queen or her eldest daughter. Among other things, it also included the killing of the Chancellor, Treasurer or Judges in the exercise of their duties. William Joyce, in 1946, was the last person to be tried for and convicted of High Treason in the UK. He was said to have committed Treason due to his Nazi activities in the war and owed allegiance to the UK by having a UK passport, although he was not actually entitled to such a passport. His punishment was execution through hanging.